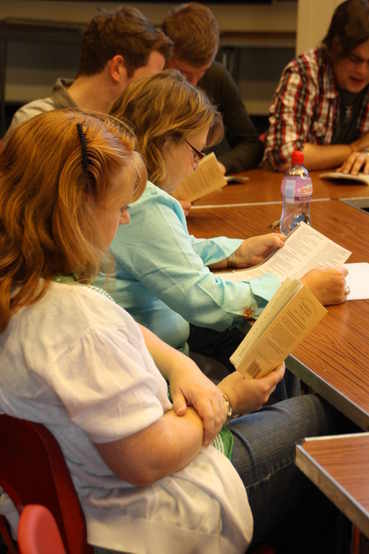 As well as putting on productions, CADS runs its own more-or-less regular Play Reading Group! It's similar in constitution to a book group, in as much as or a different person hosts each meeting in a room at a local pub or similar venue and (crucially) selects a play for the group to read "round the room". The choice of play can be anything the host decides might be interesting or illuminating or simply fun to read and may even be a mystery until the night. To date, we've read works by Alan Ayckbourn, Peter Shaffer, Willie Russell, Lee Hall, David Tristram and others, as well as a very adult script by the great Terry Johnson which may have raised some eyebrows among the pub regulars! We also had the privilege of seeing the first print of the 2016 pantomime, Aladdin by our very own Ian Sims, which subsequently played to record audiences, but we're open to suggestions - do get in touch if you'd like to propose a particular play. These meetings are definitely not auditions - the group is open to absolutely anyone, whether or not you're a CADS "regular" and you don't need to have any previous experience of drama (or indeed any future ambition to act!). The idea is normally to meet up at around 7.30 pm, and then start the reading at 8.00 pm. The evening usually lasts until about 10.00 (with a break for refills) but on occasion may go on slightly longer. (These times may vary if, for example, we have to use a different venue.) Normally, there's also no need to book - just turn up - we look forward to seeing you. So that's some time in the near future at a venue to be confirmed - watch this site for details!